Not every comic writer or artist starts at the top, working on books like Batman or X-Men. In fact, most don’t even start at Marvel or DC. Here’s a look at some work by comic book creators … before they were stars. Evan Dorkin, the creator of those dairy products gone bad, Milk & Cheese, is a comics writer and artist known for his quirky, indy work. He was the creative force behind Marvel Comics‘ Bill & Ted ongoing series from the early 1990s and was one of the writers on the TV show Space Ghost: Coast to Coast! But in 1982, at the age of 17, Marvel Comics published his first work in the letters page of Rom #37 (cover date – December 1982). 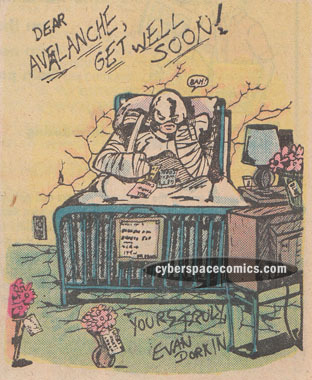 Evan had crafted some fan art sending well-wishes to Avalanche, who had recently broken both his arms in an encounter with the Hulk.